After I left Key West, I headed north to visit friends in Spring Hill. Along the way, I decided to take a little detour to Lake Okeechobee. I've seen the huge lake on maps before, but I had to see it in person. I found out that although it's a huge lake, it's awfully hard to get at. Seems to be almost surrounded with levees (I should check that spelling.). I did get to peek over the top in one spot and snap the photo below. After I saw the lake, I figured I'd better call my friends, Jim & Sally and let them know that I was running a little late, and there was still the Airboat tour to go on! The alligators came right up to the side of the boat to eat the bread that the guide tossed to them. You could reach out and pat one--if you wanted to. 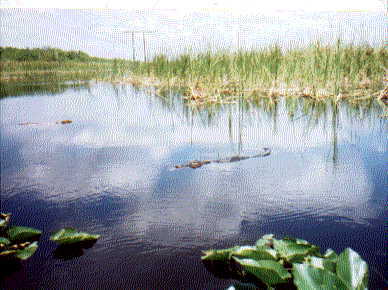 Below: Alligators coming to the boat at the Sawgrass Recreational Park boat tour--Everglades. In Spring Hill, I enjoyed my friend's hospitality for a week. And, finally got to eat some "real food" for a change instead of speghettio's out of the can and dry tuna fish on crackers--traveling on a budget is tough!. They fed me TOO good! I was starting to get spoiled. During that week I visited the Weeki Wachie Springs Park. They have a live underwater Mermaid show there that is very good. 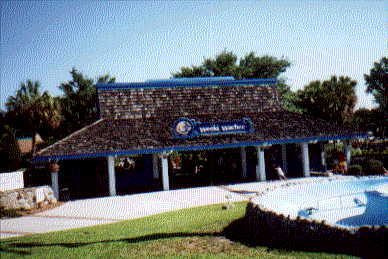 They also have live animal shows, rides for children, water slide, and a boat tour up the crystal clear spring fed river. It was a wonderful week. Sitting by the pool, watching TV, having morning coffee together at the kitchen counter, it was a great time. Sally & I went also checked out a couple of flea markets. On Sunday we went to church. They even invited me to share Easter Dinner with them! But soon the time came that I had to prepare myself for heading out "on the road" again.